Texas Instruments (TI) has introduced an op amp that combines ultra-high precision with low supply current. 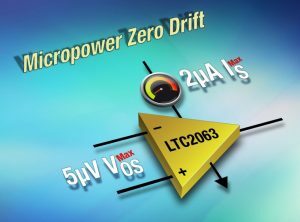 The LPV821 zero-drift, nanopower op amp enables engineers to attain the highest DC precision, while consuming 60% less power than competitive zero-drift devices, according to TI. The LPV821 is designed for use in precision applications such as wireless sensing nodes, home and factory automation equipment, and portable electronics. 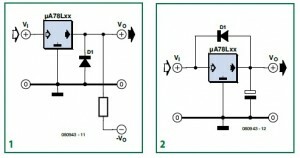 The LPV821 zero-drift op amp uses a proprietary auto-calibration technique to simultaneously provide low offset voltage (10 μV, maximum) and minimal drift over time and temperature. In addition to having low offset and ultra-low quiescent current, the LPV821 amplifier has pico-amp bias currents which reduce errors commonly introduced in applications monitoring sensors with high output impedance and amplifier configurations with megaohm feedback resistors. 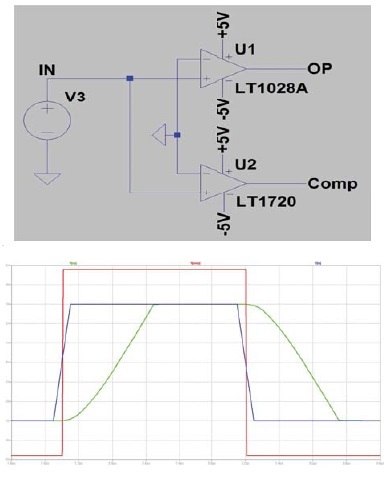 Engineers can pair the LPV821 op amp with the TLV3691 nanopower comparator or ADS7142 nanopower analog-to-digital converter (ADC) to program a threshold that will automatically wake up a microcontroller (MCU) such as the CC1310 SimpleLink Sub-1 GHz MCU, further reducing system power consumption. 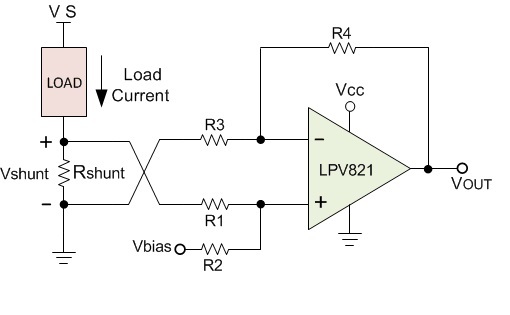 Designers can download the TINA-TI SPICE model to simulate their designs and predict circuit behavior when using the LPV821 op amp. 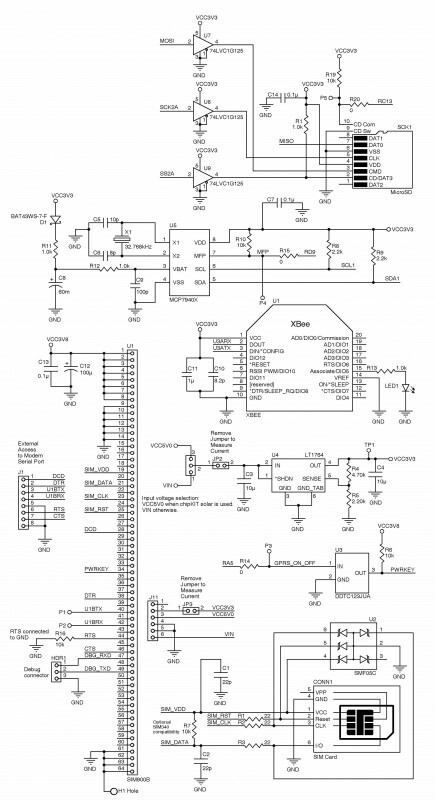 Engineers can also jump-start gas-sensing system designs using the LPV821 op amp with the Always-On Low-Power Gas Sensing with 10+ Year Coin Cell Battery Life Reference Design and Micropower Electrochemical Gas Sensor Amplifier Reference Design. Pre-production samples of the LPV821 op amp are now available through the TI store and authorized distributors in a 5-pin small-outline transistor (SOT-23) package. Pricing starts at $0.80 in 1,000-unit quantities. Analog Devices, which recently acquired Linear Technology, has announced the LTC2063 zero-drift op amp which draws just 1.3μA typ (2μA max) on a 1.8V supply. This micropower amplifier maintains high precision: maximum input offset voltage is 5μV at 25°C, maximum drift is 0.06μV/°C from –40°C to 125°C. 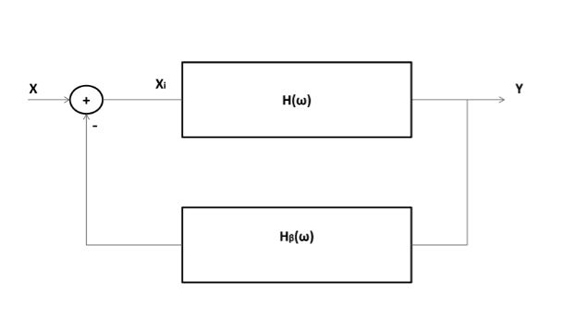 Maximum input bias current is 15pA at 25°C, and 100pA from –40°C to 125°C. 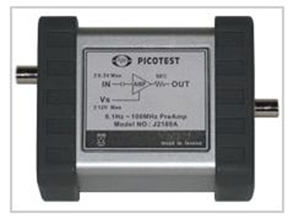 These high precision input characteristics allow the use of large value feedback network resistors, keeping power consumption low without compromising accuracy, even at elevated temperature. 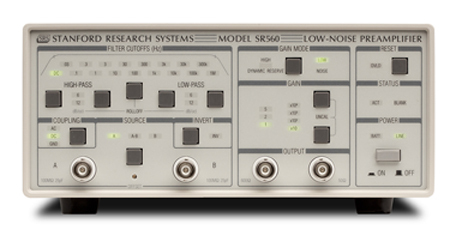 Rail-to-rail inputs and outputs simplify single supply use and enhance dynamic range. 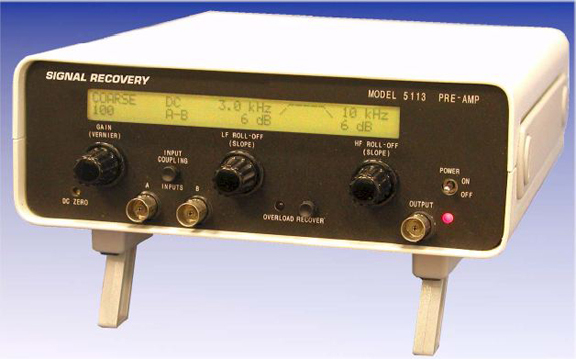 An integrated EMI filter provides 114dB electromagnetic interference rejection at 1.8GHz. With low 1/f noise inherent to its zero-drift architecture the LTC2063 is well suited for amplifying and conditioning low frequency sensor signals in high temperature industrial and automotive systems as well as portable and wireless sensor network applications. The LTC2063 is available in SOT-23 and SC70 packages. 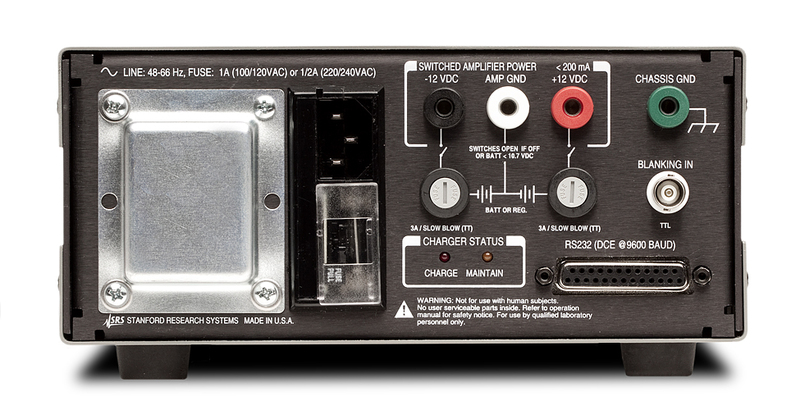 The SC70 version includes a shutdown mode which reduces current consumption to just 90nA when the amplifier is not in use. 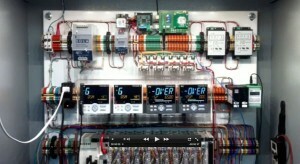 This enables ultralow power duty cycled sensor applications. For example, a precision low duty cycle oxygen sensor circuit shown in the data sheet consumes less than 200nA average current. The LTC2063 works well with Dust Networks’ SmartMesh wireless sensor networks, expanding the reach of precision measurements to places previously not practical. An example is the DC2369A wireless current sense reference board which uses the LTC2063 and LTP5901-IPM SmartMesh IP module and other micropower components to create an isolated floating current sense measurement platform which operates for years on small batteries. The LTC2063 operates on supply voltages from 1.7V to 5.25V and is fully specified from –40°C to 125°C. Pricing starts at $1.50 each in 1,000-piece quantities. 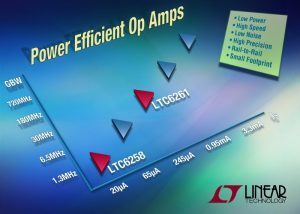 Linear Technology’s new LTC6258/59/60 and LTC6261/62/63 are part of a family of power-efficient op-amps ranging from 1.3 MHz GBW product at 20 µA supply current to 720 MHz GBW product at 3.3 mA supply current. The op-amps operate on 1.8-to-5.25-V supply, feature rail-to-rail inputs and outputs, and include versions with a Shutdown mode. Input offset voltage is 400 μV maximum. The devices are fully specified over the industrial (I, –40°C to 85°C) and extended (H, –40°C to 125°C) temperature ranges. With supply current of only 20 μA per amplifier, the LTC6258/59/60 achieve 1.3 MHz gain bandwidth product and 240 V/ms slew rate. 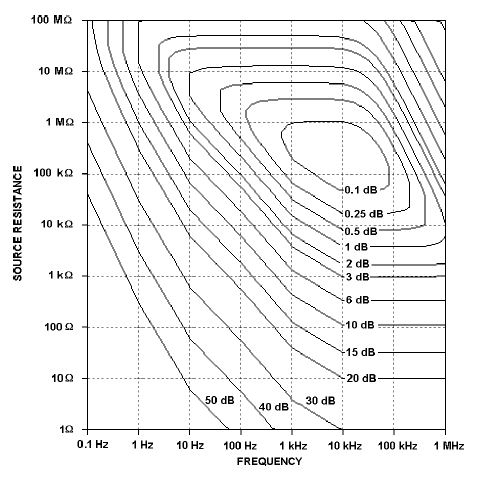 They include input EMI filters which provide 45 dB rejection at 1 GHz. They are stable for any gain and with any capacitive load. The LTC6261/62/63 achieve 30 MHz GBW product and 7 V/μs slew rate, drawing just 240 μA per amplifier. 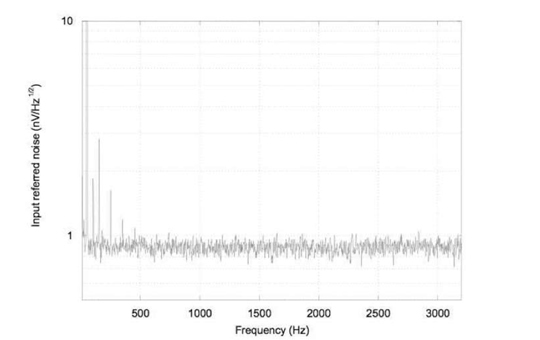 Wideband voltage noise is just 13 nV/√Hz. They are stable for any gain and for capacitive loads up to 1 nF. The single LTC6258 and LTC6261 are available in a space saving 2 mm × 2 mm DFN package, priced starting at $1.24 each in quantities of 1000 pieces. The dual LTC6259 and LTC6262 are available in the same size DFN package, as well as eight-lead SOT-23, MSOP-8, and MSOP-10 with Shutdown mode. The quad LTC6260 and LTC6263 are available in the MSOP-16 package. ON Semiconductor recently unveiled a new family of ultra-low power precision operational amplifiers. 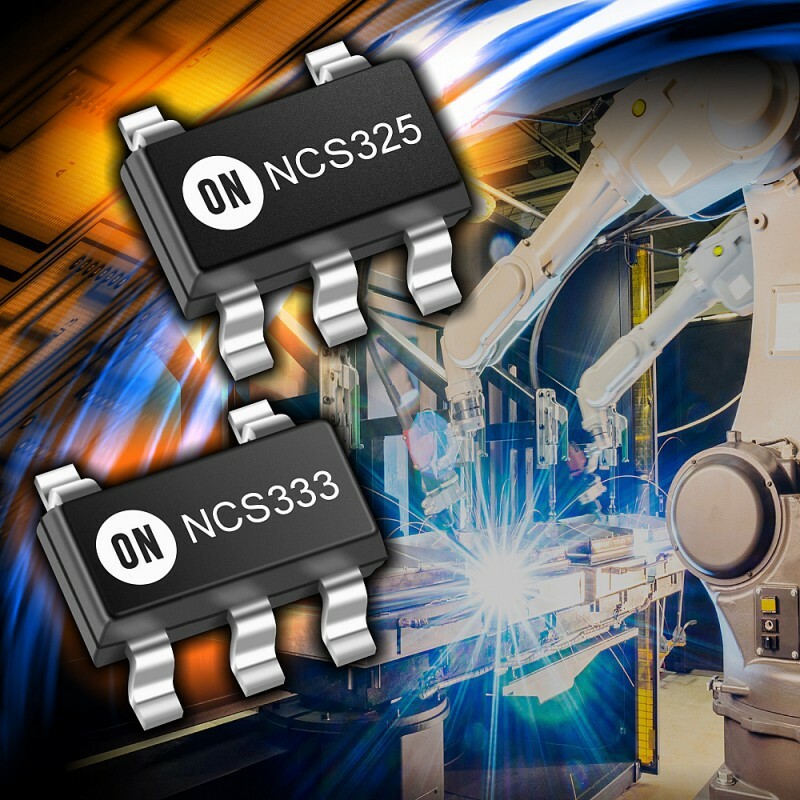 The precision NCS325 and NCS333 CMOS op-amps deliver zero drift operation and quiescent current for front-end amplifier circuits and power management designs. The op-amp devices enhance the accuracy of motor control feedback and power supply control loops, thereby contributing to higher overall system efficiency. These devices are complemented by the new NCV333 automotive-qualified (AEC-Q100 grade 1) op-amp offering similar functional performance for power train, braking, electronic power steering, valve controls, and fuel pump and fuel injection system applications. Rail-to-rail input and output performance and are optimized for low voltage operation of 1.8 volt (V) to 5.5 V, with a best in class quiescent currents of 21 µA and 17 µA respectively at 3.3 V.
Operate with a gain bandwidth of 350 kHz with ultra-low peak-to-peak noise down to 1.1 µV from 0.1 Hz to 10 Hz. The NCS325 is available in a 3 mm × 1.5 mm five-pin TSOP package. It costs $0.35 per unit in 3,000-unit quantities. The NCS333 comes in a 1.5 mm × 3 mm SOT23-5 package or in a 2 mm × 1.25 mm SC70-5. It costs $0.5 per unit in 3,000-unit quantities. NAN: Tell us about your start-up company, Narobo. 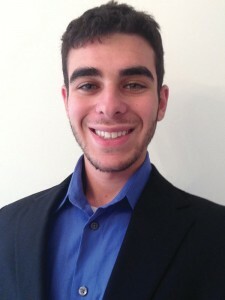 ERIC: Narobo is essentially the company through which I do all my consulting work. I’ve built everything from dancing robots to cellular field equipment. Most recently I’ve been working with some farmers in the Midwest on remote monitoring. We monitor a lot of different things remotely, and I’ve helped develop an online portal and an app. The most interesting feature of our system is that we have a custom tablet rig that can interface directly to the electronics over just the USB connection. We use Google’s Android software development kit to pull that off. ERIC: The DroneCell was my second official product released, the first being the Roboduino. 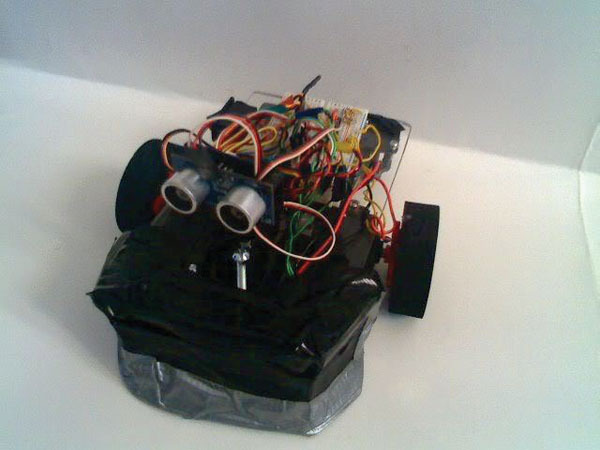 The Roboduino was relatively simple; it was just a modified Arduino that made building robots easy. We used to sell it online at CuriousInventor.com for a little while, and there was always a trickle of sales, but it was never a huge success. I still get a kick out of seeing Roboduino in projects online, it’s always nice to see people appreciating my work. 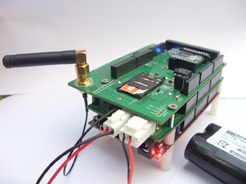 The DroneCell is a cellular module board that communicates with devices with TTL UARTs. The DroneCell is the other product of mine, and my personal favorite. It’s a cellular module board geared toward the hobbyist. A few years ago, if you wanted to add cellular functionality to your system you had to do a custom PCB for it. You had to deal with really low voltage levels, very high peak power draws, and hard-to-read pins. DroneCell solved the problem and made it very easy to interface to hobbyist systems such as the Arduino. Putting on proper power regulation was easy, but my biggest design challenge was how to handle the very low voltage levels. In the end, I put together a very clever voltage shifter that worked with 3V3 and 5 V, with some calculated diodes and resistors. NAN: Tell us about your first project. Where were you at the time and what did you learn from the experience? Eric’s Butler robot was his first electronics project. He started building it when he was still in high school. 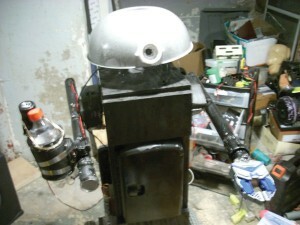 ERIC: The Butler robot was my first real electronics project. I started building it in ninth grade, and for a really stupid reason. I just wanted to build a personal robot, like on TV. My first version of the Butler robot was cobbled together using an old laptop, a USB-to-I/O converter called Phidgets, and old wheelchair motors I bought on eBay. I didn’t use anything fancy for this robot, all the software was written in Visual Basic and ran on Windows XP. For motor controllers, I used some old DPDT automotive relays I had lying around. They did the job but obviously I wasn’t able to PWM them for speed control. My second version came about two years later, and was built with the intention of winning the Instructables Robot contest. I didn’t win first place, but my tutorial “How to Build a Butler Robot” placed in the top 10 and was mentioned in The Instructables Book in print. This version was a cleaner version of everything I had done before. I built a sleek black robot body (at least it was sleek back then!) and fabricated an upside-down bowl-shaped head that housed the webcam. The electronics were basically the same. The main new features were a basic robot arm that poured you a drink (two servos and a large DC motor) and a built-in mini fridge. I also got voice command to work really well by hooking up my Visual Basic software with Dragon’s speech-to-text converter. The Butler robot was a great project and I learned a lot about electronics and software from doing it. If I were to build a Butler robot right now, I’d do it completely differently. But I think it was an important to my engineering career and it taught me that anything is possible with some hacking and hard work. At the same time as I was doing my Butler robot (probably around 2008), I lucked out and was hired by an entertainer in Hong Kong. He saw my Butler robot online and hired me to build him a dancing robot that was synced to music. We solved the issue of syncing to music by putting dual-tone multi-frequency (DTMF) tones on the left channel audio and music on the right channel. The right channel went to speakers and the left channel went to a decoder that translated DTMF tone sequences to robot movement. This was good because all the data and dance moves were part of the same audio file. All we had to do was prepare special audio files and the robot would work with any music player (e.g., iPod, laptop, CD, etc.). The robot is used in shows to this day, and my performer client even hired a professional cartoon voice actor to give the robot a personality. NAN: You were an adjunct professor at the Cooper Union for the Advancement of Science and Art in New York City. What types of courses did you teach and what did you enjoy most about teaching? ERIC: I will be entering my senior year at Cooper Union in the Fall 2014. Two years ago, I took a year off from school to pursue my work. This past year I completed my junior year. I taught a semester of “Microcontroller Projects” at Cooper Union during my year off from being a student. We built a lot of really great projects using Arduino. One final project that really impressed me was a small robot car that parallel parked itself. Another project was a family of spider robots that were remotely controlled and could shrink up into a ball. Cooper Union is filled with really bright students and teaching exposed me to the different thought processes people have when trying to build a solution. I think teaching helped me grow as a person and helped me understand that in engineering—and possibly in life—there is no one right answer. There are different paths to the same destination. I really enjoyed teaching because it made me evaluate my understanding about electronics, software, and robotics. It forced me to make sure I really understood what was going on in intricate detail. NAN: You have competed in robotics competitions including RoboCup in Austria. Tell us about these experiences—what types of robots did you build for the competitions? Eric worked with his high school’s robotics team to design this robot for a RoboCup competition. ERIC: In high school I was the robotics team captain and we built a line-following robot and a soccer robot to compete in RoboCup Junior in the US. We won first place in the RoboCup Junior Northeast Regional and were invited to compete in Austria for the International RoboCup Junior games. So we traveled as a team to Austria to compete and we got to see a lot of interesting projects and many other soccer teams compete. I remember the Iranian RoboCup Junior team had a crazy robot that competed against us; it was built out of steel and looked like a miniature tank. My best memory from Austria was when our robot broke and I had to fix it. Our robot was omnidirectional with four omni wheels in each corner that let it drive at any angle or orientation it wanted. It could zigzag across the field without a problem. At our first match, I put the robot down on the little soccer field to compete… and it wouldn’t move. During transportation, one of the motors broke. Disappointed, we had to forfeit that match. But I didn’t give up. I removed one of the wheels and rewrote the code to operate with only three motors functional. Again we tried to compete, and again another motor appeared to be broken. I removed yet another wheel and stuck a bottle cap as a caster wheel on the back. I rewrote the code, which was running on a little Microchip Technology PIC microcontroller, and programmed the robot to operate with only two wheels working. The crippled robot put up a good fight, but unfortunately it wasn’t enough. I think we scored one goal total, and that was when the robot had just two wheels working. After the competition, during an interview with the judges, we had a laugh comparing our disabled robot to the videos we took back home with the robot scoring goal after goal. I learned from that incident to always be prepared for the worst, do your best, and sometimes stuff just happens. I’m happy I tried and did my best to fix it, I have no regrets. I have a some of the gears from that robot at home on display as a reminder to always prepare for emergencies and to always try my best. 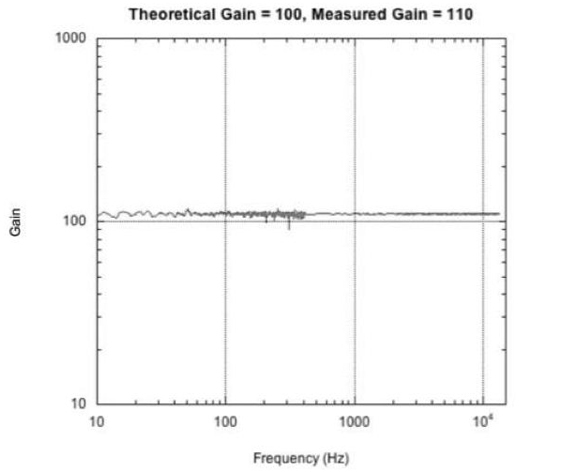 gain of 2 and a 2.5-V “virtual ground.” The result is that 2.5 V is the new “zero” voltage. 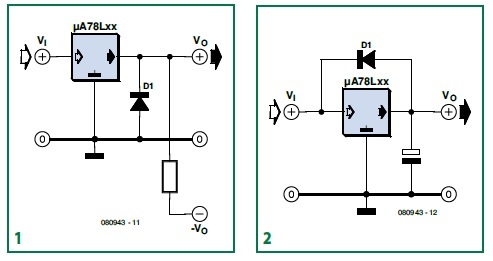 You can achieve –5 V by giving the op-amp 0 V, a –2.5-V difference that is amplified by 2 to yield 5 V. Similarly, 5 V is a 2.5-V difference from the virtual ground, amplified by 2 it provides a 5-V output. ERIC: I think the next big thing will be personalized health care via smartphones. There are already some insulin pumps and heart monitors that communicate with special smartphone apps via Bluetooth. I think that’s excellent. We have all this computing power in our pockets, we should put it to good use. It would be nice to see these apps educating smartphone users—the patients themselves— about their current health condition. It might inspire patients/users to live healthier lifestyles and take care of themselves. I don’t think the FDA is completely there yet, but I’m excited to see what the future will bring. Remember, the future is what you build it to be. Microchip Technology, Inc. announced Monday from EE Live! and the Embedded Systems Conference in San Jose the PIC16(L)F170X and PIC16(L)F171X family of 8-bit microcontrollers (MCUs), which combine a rich set of intelligent analog and core independent peripherals, along with cost-effective pricing and eXtreme Low Power (XLP) technology. Available in 14-, 20-, 28-, and 40/44-pin packages, the 11-member PIC16F170X/171X family of microcontrollers integrates two op-amps to drive analog control loops, sensor amplification and basic signal conditioning, while reducing system cost and board space. PIC16F170X/171X MCUs reduce design complexity and system BOM cost with integrated op-amps, zero cross detect, and peripheral pin select. These new devices also offer built-in Zero Cross Detect (ZCD) to simplify TRIAC control and minimize the EMI caused by switching transients. Additionally, these are the first PIC16 MCUs with Peripheral Pin Select, a pin-mapping feature that gives designers the flexibility to designate the pinout of many peripheral functions. 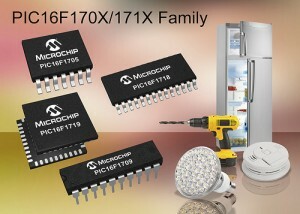 The PIC16F170X/171X are general-purpose microcontrollers that are ideal for a broad range of applications, such as consumer (home appliances, power tools, electric razors), portable medical (blood-pressure meters, blood-glucose meters, pedometers), LED lighting, battery charging, power supplies and motor control. The new microcontrollers feature up to 28 KB of self-read/write flash program memory, up to 2 KB of RAM, a 10-bit ADC, a 5-/8-bit DAC, Capture-Compare PWM modules, stand-alone 10-bit PWM modules and high-speed comparators (60 ns typical response), along with EUSART, I2C and SPI interface peripherals. They also feature XLP technology for typical active and sleep currents of just 35 µA/MHz and 30 nA, respectively, helping to extend battery life and reduce standby current consumption. The PIC16F170X/171X family is supported by Microchip’s standard suite of world-class development tools, including the PICkit 3 (part # PG164130, $44.95), MPLAB ICD 3 (part # DV164035, $189.99), PICkit 3 Low Pin Count Demo Board (part # DM164130-9, $25.99), PICDEM Lab Development Kit (part # DM163045, $134.99) and PICDEM 2 Plus (part # DM163022-1, $99.99). The MPLAB Code Configurator is a free tool that generates seamless, easy-to-understand C code that is inserted into your project. 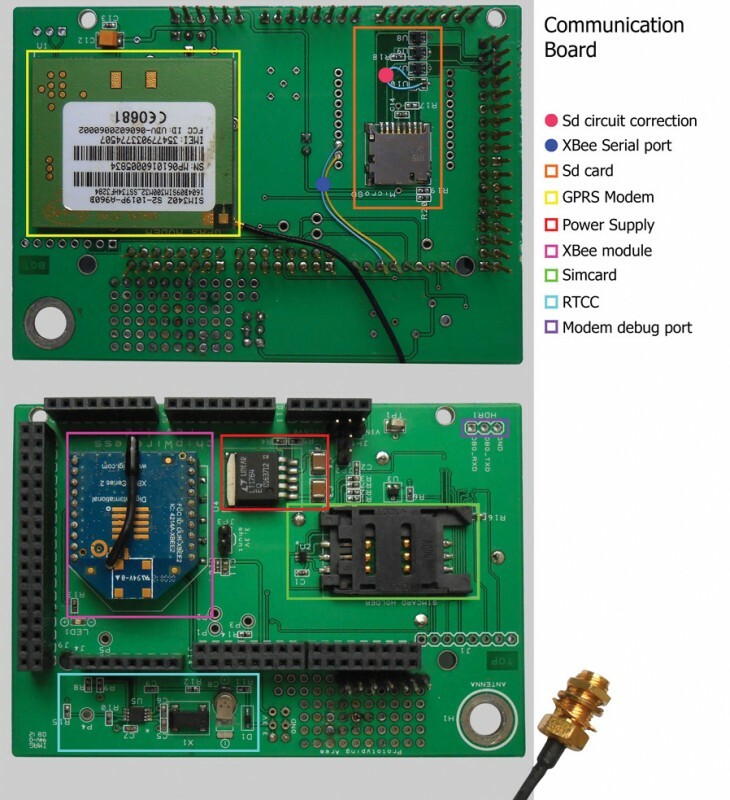 It currently supports the PIC16F1704/08, and is expected to support the PIC16F1713/16 in April, along with all remaining microcontrollers in this family soon thereafter. The PIC16(L)F1703/1704/1705 microcontrollers are available now for sampling and production in 14-pin PDIP, TSSOP, SOIC and QFN (4 x 4 x 0.9 mm) packages. The PIC16F1707/1708/1709 microcontrollers are available now for sampling and production in 20-pin PDIP, SSOP, SOIC and QFN (4 x 4 x 0.9 mm) packages. The PIC16F1713/16 MCUs are available now for sampling and production in 28-pin PDIP, SSOP, SOIC, QFN (6 x 6 x 0.9 mm) and UQFN (4 x 4 x 0.5 mm) packages. The PIC16F1718 microcontrollers are expected to be available for sampling and production in May 2014, in 28-pin PDIP, SSOP, SOIC, QFN (6 x 6 x 0.9 mm) and UQFN (4 x 4 x 0.5 mm) packages. The PIC16F1717/19 microcontrollers are expected to be available for sampling and production in May 2014, in 40/44-pin PDIP, TQFP and UQFN (5 x 5 x 0.5 mm). Pricing starts at $0.59 each, in 10,000-unit quantities.